Despite it being a fact that a young child could tell you, little is known about disease transmission through aerosol droplets. A new technique developed at the University of Bristol (UK) could begin to change that. A new technique for studying disease transmission through aerosol droplets has been developed by researchers at the University of Bristol, led by Jonathan Reid. The technique allows the researchers to examine the impact of environmental factors on the transmission of disease, down to the level of one aerosol droplet. 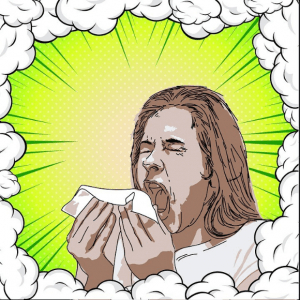 An average cough or sneeze expels 100,000 germs into the air at 100 mph in aerosol droplets, a typical source of airborne disease transmission. The impact of the environment that these droplets are ejected into on the viability of transmission, be it variations in humidity, temperature or light, is currently poorly understood. To better understand these impacts the research team developed a droplet-on-demand technology that can generate tailored bioaerosol droplets containing precise amounts of a pathogen at a volume of one droplet to over 100. A cloud of these droplets can then be captured by an electrodynamic trap and suspended in a controlled chamber where the researchers can manipulate the environment. The droplets can be held in this chamber for anywhere from 5 minutes to 5 days and the droplets can be extracted at intervals to examine the number of colony-forming pathogens present. This technique allows for measurements to a specificity of one droplet or a single bacterium and at interval times down to 1 second. This distinctly surpasses the precision of previous techniques used in similar studies, which involve capturing droplets on spiders’ webs or adding large droplet populations to rotating drums. “This new technique offers the eventual prospect of allowing refined measurements to improve our understanding of the transmission of many airborne diseases including tuberculosis, the influenza virus, and foot and mouth disease,” explains Reid. So far, the technique has shown that as droplets evaporate, the salt concentrations rise and place any pathogens present under significant osmotic stress, therefore reducing their viability. The next step for the research is to use this newly developed technique to study the effects of disparate environmental factors, enlightening us of the possible vulnerabilities of pathogenic transmission.